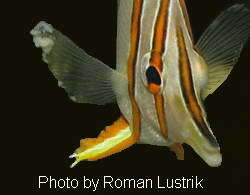 Treatment: This condition often clears up as the fish gains overall health, so good water quality and diet is a must. In serve cases the cauliflower-like growths can be cut off with a knife, or scrapped off by using the nail of your thumb. Identification: Irregular cauliflower-like spots of varying sizes, usually on the fins and body; most often the spots are white. Prevention: Stress makes fish vulnerable to this viral infection - keeping stress levels low and water quality high is the best prevention.